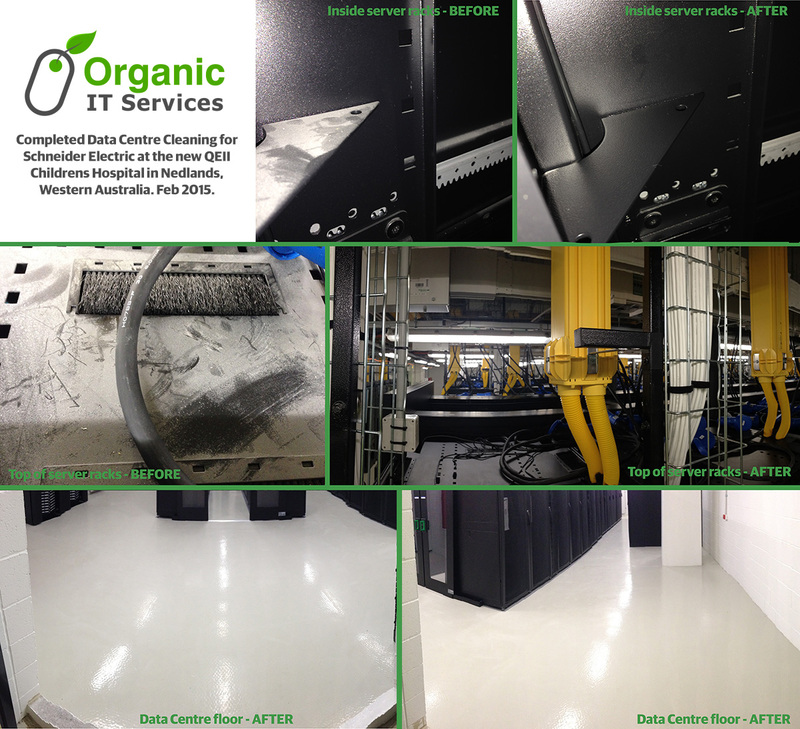 Organic IT Services are your preferred Data Centre Cleaning Perth specialists. We are a locally owned and run company, currently trusted to service many large oil and mining companies, as well as many local government buildings. Organic IT Services pride ourselves in making your company a priority, being highly available and extremely reliable. We can provide you with a professional corporate proposal, including scope of work, method of works and pricing, usually within 48 hours after a site visit. Why does my business need Data Centre Cleaning? 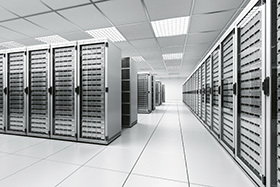 The need to prevent and remove contamination inside Data Centres (computer rooms) is directly related to preventing downtime and increasing the performance and reliability of your Data Centre’s data processing equipment. Organic IT Services realises the importance of proactively managing Data Centre cleaning to ensure your business never suffers any Data Centre disruption. Disruption can lead to unscheduled downtime, which can lead to huge potential lost revenue for your business. As part of our proposal process, we visit your site and discuss requirements with your IT representative, providing customised input into the scope of your IT cleaning. Organic IT Services recommends you have your own IT Representative audit the quality of our cleaning services periodically, but be rest assured, we perform our own regular audits on our own cleaning staff regularly to ensure the highest of standards. The only way to prove your Data Centre is clean according to Standards Australia and Sun Microsystems is to have a professional air particulate measurement test done. We perform Air Particulate measuring and reporting to certify the level of dust particulates in your data centre are at safe levels according to the international ISO 14644 cleanroom standards. Includes cleaning the surface of the raised floor panels. Performed monthly, this service includes vacuuming and damp mopping the floor surface with cleaning chemicals approved for use in Data Centre environments. Organic IT Services use only the most advanced vacuum cleaners with HEPA filters. This ensures your Data Centre is free of dust and contamination to ISO 14644 Standards Australia and Sun Microsystems standards. Includes monthly cleaning of the exterior surface of cabinets, equipment and workstations by vacuuming where applicable with critical filtered vacuums, and then wiped clean with an approved anti-static cleaner approved for use in Data Centre environments. Includes quarterly cleaning of the surface of the server cabinet doors, server exhaust fans, and surfaces of the servers inside the cabinet. Surfaces are vacuumed with critical filtered vacuums and then wiped clean using an approved anti-static cleaner approved for use in Data Centre environments. Includes detailed vacuuming and cleaning with specialised anti-static hand towels of cables and overhead cable trays. Includes quarterly overhead cleaning by either vacuuming above the drop ceiling tiles by using critical filter vacuums in compliance with recognised standards for cleaning Data Centres, and / or vacuuming and wiping clean overhead raceways with an approved anti-static cleaner approved for use in Data Centre environments. Includes applying an approved anti-static floor finish to non-raised floor surfaces to prevent dangerous static build-up. Manufacturers of high pressure laminated (HPL) access floor panels strongly recommend never to apply floor wax to the surface of the access floor panels. Performed quarterly. Includes vacuuming the concrete subfloor using specialised critical filter vacuums in compliance with recognised standards for Data Centre Cleaning Perth services. Performed annually, this service removes contamination from your subfloor to eliminate the build-up of particulate that can be carried into your room’s air flow and cause downtime inside your equipment. Includes a sampling of airborne particulates within your Data Centre utilising a laser particle counter. Particulate sampling is an indicator of airborne contamination and is the only way to prove your Data Centre meets ISO Data Centre cleanroom standards. If your Data Center has undergone expansion or is brand new, we can offer a comprehensive clean before your valuable IT equipment is installed. In 2015, we have performed post-construction data centre cleaning for BHP Billiton, QEII Children’s Hospital and the new Shell Australia headquarters in Kings Square, Perth.